Choosing the right non-structural vinyl porch column option can dramatically change the look of your porch and create impressive curb appeal. Since these columns wrap around your existing columns, you have lots of options for different styles. 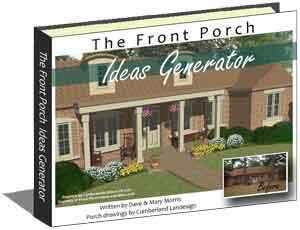 Mary and I like the idea of creating a new look for your home by simply changing the columns. Choose a vinyl option for easy maintenance, durability, and an aesthetically pleasing look - you just can't beat these columns. 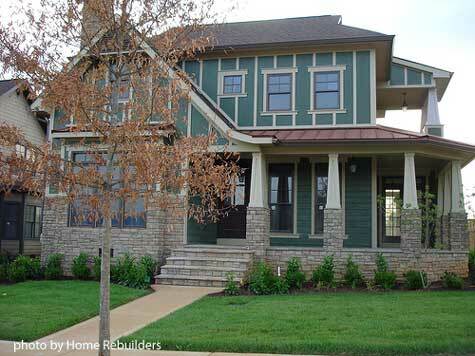 You too, can have Craftsman-style porch columns like those in the photo above. 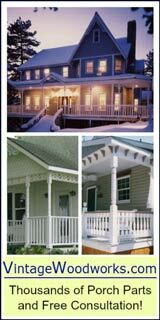 By simply wrapping around your existing porch columns, you can easily transform your front porch using non-structural vinyl or Cellular PVC. It's that easy! 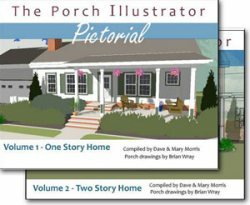 Try the following easy-to-do front porch column ideas for transforming your porch, patio, or deck today. Vinyl wraps usually consist of from 2 to 4 sections that overlap and are sealed with a special adhesive like OSI or PVC rated silicone. Other models snap together and are adjustable to accommodate various inside dimensions. 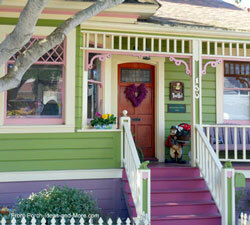 Wraps are ideal for transforming the look of your porch or for hiding old discolored posts. Another option is vinyl column sleeves that fit over standard wood columns. 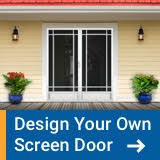 They come in several different colors and are normally used in new construction or in extensive remodeling projects. 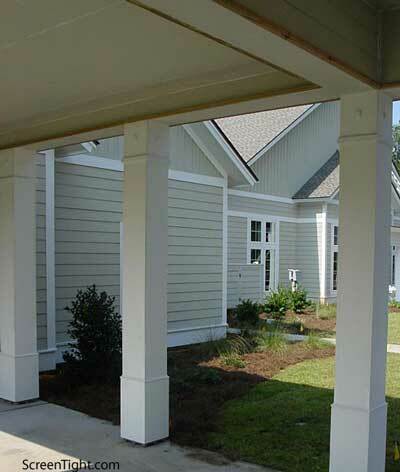 When selecting non-structural porch columns we highly recommend choosing cellular PVC rather than just vinyl. The difference is important. Cellular PVC (polyvinyl chloride) is a synthetic material like vinyl but it looks, feels, and sounds like wood. We've discovered you can even have your columns custom made. This helps in two ways. First, because porch columns heights are almost never at standard heights, you can order columns to meet your specific requirements. Second, you can even have them designed to meet your own particular style. Make a statement, design with a logo perhaps, or just create a stunning decorative design. We found the following columns in Cellular PVC and believe you will like them too! 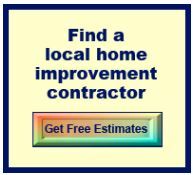 This product is an easy project for almost any homeowner. Update the look of your existing columns with Wrap and Snap from Screen Tight™. It is a one piece PVC product that wraps around your column and snaps into place. Place adhesive in the grooves, extend it around you typical wooden post, and snap into place. It will cover 4x4, 4x6, 6x6, 8x8 and 10x10 porch columns. You can order it in either 8.5-foot and 10-foot lengths which you can then cut to size. Versatile, it comes in a variety of styles too. Choose from square, rectangular, fluted, and tapered along with caps and trims. 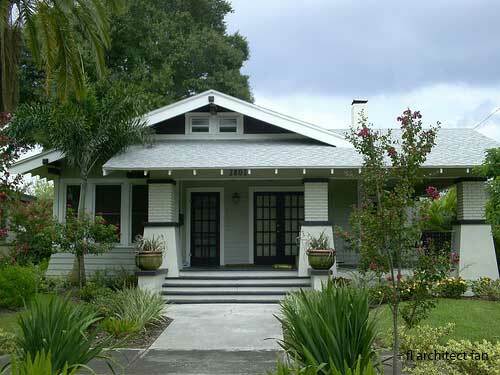 Craftsman-style porches have a very distinctive look. The most notable feature is the tapered columns. You can achieve this look by using vinyl porch columns made from cellular PVC. Vintage Woodworks non-structural columns (pictured at right) are designed to surround existing porch columns. 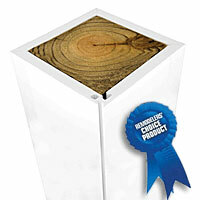 They look and work like wood but are not affected by insects, rot, or moisture. Architecturally authentic, craftsman PVC porch columns require very little maintenance. In addition, they are available in three styles - plain, recessed, or raised panel. Don't forget the pedestals. In the photo below, columns are supported by stone-faced pedestals. To achieve a similar look, we suggest you use vinyl pedestals over your existing porch support columns. You can paint them to coordinate with your vinyl porch columns. Although they won't be stone, they will give your porch an aesthetically pleasing look at far less the expense. Craftsman columns normally rest on pedestals as depicted in the photo above. Pedestals are usually made from stone, concrete, brick, or wood. 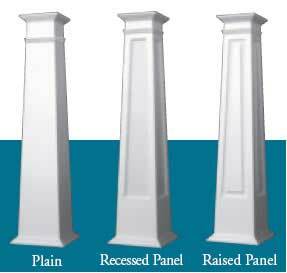 PVC column pedestals look like wood and are designed to complement the front porch support columns above. Vintage Woodworks PVC pedestals are non-structural, and like their columns above, are meant to wrap around existing column supports. Please Note: Non-structural columns and pedestals are meant to be fastened around existing porch column supports that have the proper load bearing capacities. Load bearing is a factor of the specific type of post be it wood, steel, etc. An engineer or architect can determine the correct load bearing capacity of a support column. 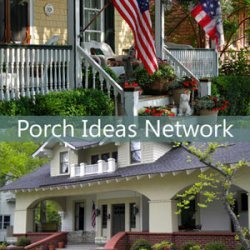 Be sure to see our gallery of Craftsman porches to get even more ideas! If you are looking for non-structural columns, take a look at Vintage Woodworks. 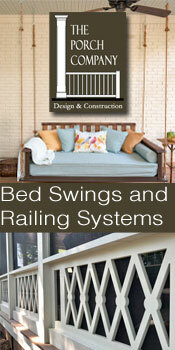 They also have an expansive array of porch columns, railings and exterior house trims. 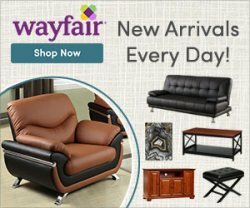 For more information, please visit their featured porch parts page.